As a project created in Landmark Education’s Self-Expression and Leadership Program, Ishreen Bradley took on creating an event to enable people of influence to enquire into and expand their appreciation of the unique challenges faced by Muslims from different regions of the world, whilst celebrating the current cultural contribution of Islam to her country, the United Kingdom. 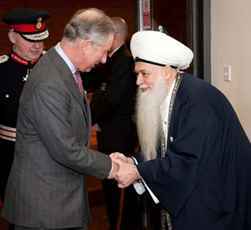 The result of the project was a visit by Prince Charles as the guest of honor of the British Sufi muslim community at the Manchester United football grounds in Old Trafford on February 4th. At the event the Prince heard a musical recitation of the Quran and watched an exhibition of dancing by whirling dervishes dressed in traditional costumes. The event, which was hosted by Sufi spiritual leader Shaykh Mohammed Hisham Kabbani and which marked the opening of the Centre for Spirituality and Cultural Advancement, highlighted the positive contributions of Sufi traditions and practices to British society, and featured the testimonies of those rehabilitated from criminal behavior who told of the influence of Sufi skills such as art, music and silat in changing their behavior. In addition to Prince Charles, the event featured a wide range of other notable guests and foreign delegations. The mayor and mayoress of Manchester, the Bishop of Middleton, the Chaplain of Stockport College, the Earl of Yarlborough, senior members of parliament and a Swiss Baron were all among the attendees, along with delegations that highlighted a range of different delegations and dignitaries that highlighted different aspects of the muslim world community. Also attending were musicians from Morocco, delegations from Kosovo and Somalia, and a group of senior Pakastani scholars who have been supporters of Shaykh Hisham’s campaign to educate people about Islam and provide grass roots initiatives to deter them from extremism. Thank you for publishing news like this on Islam to show the humanitarian side of the religion and it’s true meaning. Congratulations to Ishreen on her project. many congratulations on your project.